"Sandalo e The" means "Sandalwood and Tea", and that is pretty much what you get, except that there is a tobacco-ish quality to it that is quite nice, and a bristly, spiny quality that isn't. There is also purportedly a quantity of roses, but they must have missed the curtain call, because I can't spot them anywhere. The scent never smooths out or calms down as I kept hoping it would: it stays pointy and overly aggressive for a long time, because, predictably, the less you like a scent, the longer it is liable to stay on your skin. It isn't horrible or despicable, but it isn't very interesting or pleasant, either. 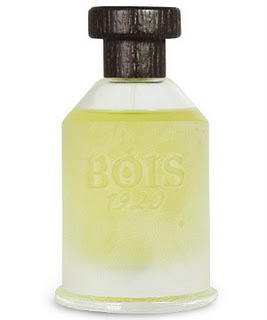 I did another Bois 1920 a couple of weeks ago and I didn't like that one, either. I have six more floating around that I'm sure I'll get to sooner or later, but I hope these first two aren't the beginning of a trend, especially since some of the other Bois 1920 scents have intriguing names like Sushi Imperiale (nothing to do with raw-fish sushi, apparently, though I don't know for sure) and Vetiver Ambrato ("ambered vetiver", which sounds like it ought to be really nice).